If pasta and noodles is involved in regular meals in your house then how about making them as fresh as they can be with the clever Philips Noodle Maker. 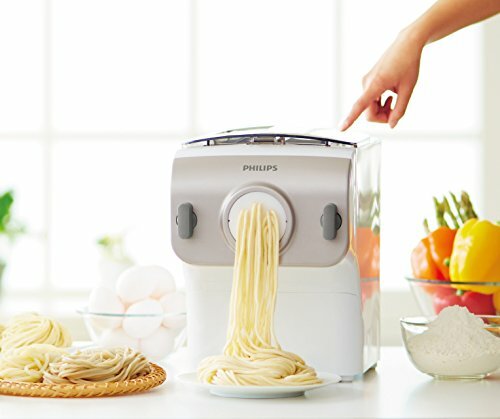 Making noodles may sound like an unnecessary chore but it does’nt have to be as the Philips Pasta Noodle Maker will turn your fresh ingredients into noodles ready to cook in just 15 minutes. This stylish worktop device designed by Philips looks great, while looking the part it is also very easy to use. Just put in your flour, eggs, water, and anything else you want to mix in, then hit start and let the machine take care of it all. It will start off by mixing the ingredients and then go onto kneading them into a dough before extruding into the familiar-looking ribbon-like tubes you can then use with in your favourite meals using a 1600lb force during extrusion. In the box you will find four different extrusion caps that will automatically cut the noodles into a specific shape, these include Spaghetti, Penne, Fettuccini & Lasagna. Each cap can be easily changed on the front of the device and when extruded you will get the desired shape and style. These caps can be stored in a handy drawer at the base of the device that slides open at the front. The discs for extrusions are also cleverly designed with a one-push cleaning tool that makes cleaning the shaping discs really easy. 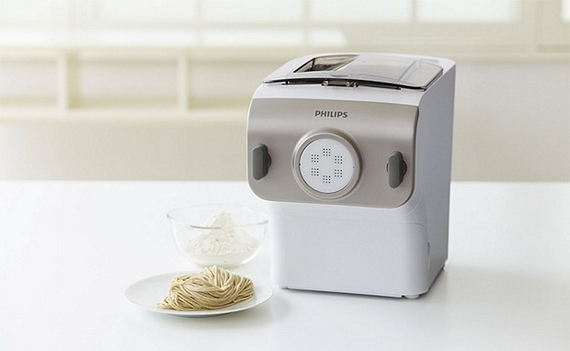 The Philips Noodle Maker can produce up to 500 grams of noodles in one go, taking just 15 minutes to make. This should be enough for 4 people and one single evening meal. Of course once it is done and you can just drop in some more ingredients and hit start and off it goes again. As you control what the noodles are made from you can add in what you like and also adjust the quality of ingredients to your liking. By using different flour and adding different ingredients like egg, herbs or spinach and carrot juice, you can make various types and flavors of pasta allowing you to get creative in the kitchen and see what you can come up with! With over 200 reviews on Amazon and 4.5 star rating this is a great device and makes creating your own pasta noodles literally as easy as throwing in the ingredients. At over $250 this isn’t cheap, but if you like your fresh pasta then it is a great investment.